DUMBARTON went down to an embarrassing 5-1 defeat by bottom of the table Livingston in a downpour at the Bet Butler Stadium. DUMBARTON went down to an embarrassing 5-1 defeat by bottom of the table Livingston in a downpour at the Bet Butler Stadium in front of a 754 crowd. Recently Sons lost 5-1 at home to SPFL Championship leaders Hearts, yet emerged from the game with some credit. Not so against the Livi Lions. New on loan signings Stuart Findlay from Celtic and Dylan Easton from St Johnstone both made impressive home debuts, while youngster Donald McCallum from Cambeltown scored Sons late consolation goal, his first Championship goal. But the positives stopped there. It was a fairly even first half, with the home side coming close on several occasions but the goal coming at the other end from Jordan White. It was a fairly awful second half, as the visitors exploited gaping holes in the Sons defence as they threw caution to the strong wind and charged forward. But they kept losing possession, and it resulted in goals at the other end from Danny Mullen (2), Keaghan Jacobs and White again. On loan Aberdeen keeper Danny Rogers must have been left wondering what his mentor, Jim Leighton, who had come to watch him, made of it all — though the keeper had little chance with the five goals. 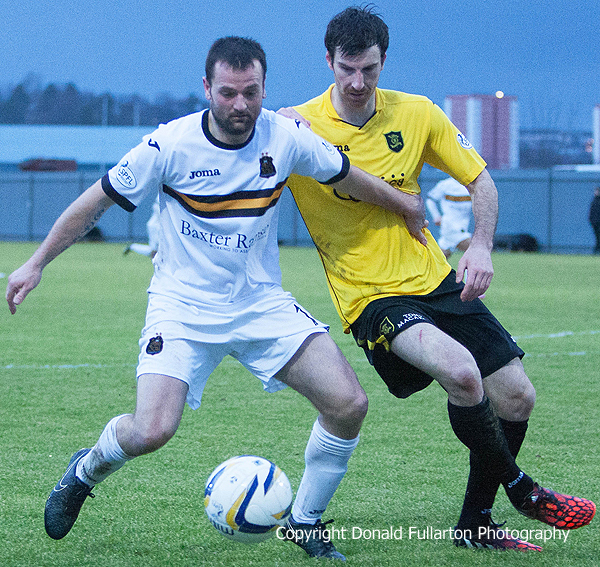 The picture shows Sonstrust man of the match Garry Fleming holding off a defender.